Usually we describe our world as a world consisting of three spatial dimensions (sometimes called 'the three degrees of freedom') and one temporal dimension (the one directional flow of time) which together enable us to move and change in the space-time continuum we live in. 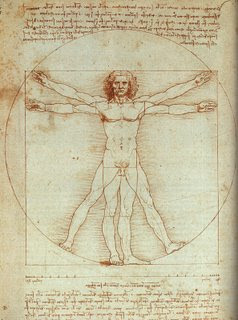 Leonardo Da Vinci's 'Universal Human' shows two of those dimensions (height and width) in his drawing of a human on a flat surface; the third dimension (depth) is suggested by the shading (called sfumato) in the picture. Time in this picture can be seen as being expressed by the multiple arms and legs which, in addition to showing how a circle can possibly be squared, also represents mobility and change over time. Although it appears as though we live in 4 dimensional space-time, it is currently scientifically attested that we live in a universe that can be mathematically described in terms of eleven dimensions: nine spatial degrees of freedom and two temporal ones according to M or String Theory. The second temporal dimension (orthogonal or perpendicular to our usual experience of time) realises itself every time when the probability (inspiredly imaginative) of creative action is turned into actual concrete action: when time gets squared... otherwise called "the collapse of the wave function."